After last week’s hard workout, some consolidation of repertoire was the focus of the SMG whistle class this week. However, by request we looked at the air of a song from the Scottish Borders that is associated with Robert Burns, Ca’ the Yowes tae the Knowes. The title translates from the Scots as “Call the ewes to the hills” and is a love song from a woman’s perspective. Burns wrote many adapted versions of traditional songs and this one dates to 1789. More information of it on this BBC site and on numerous Burns sites, such as this. YouTube also has some fine performances of it. The whistlers are also looking ahead and I have added a couple of Shetland reels for us to look at, also by request. Lay Dee at Dee and Da Ferry Reel were suggested by Steve who also pays fiddle. Shetland has a very strong and distinctive fiddle tradition that seems to suit the whistle and flute. We perhaps have Cathal McConnell, the County Fermanagh singer, flute and whistle player long resident in Edinburgh, to thank for highlighting the accessibility. For many years he has been in The Boys of the Lough, whose lineup has included Shetland fiddler Aly Bain. According to Nigel Gatherer, who gives further background to the reels, Tom Anderson and Aly Bain first recorded these together with Miss Spence’s Reel. The title Lay Dee at Dee roughly translates as “keep to yourself!”, while Da Ferry Reel doesn’t refer to boats linking the islands, but to a fairy, the supposed source of the tune itself. Da in Shetland titles translates as “the”. We’ll be looking at these reels after this week’s break. Resources are already up. Meanwhile, the FluteFling Improvers group had a fair old workout as they continued working on some Irish reels. The Maids of Mount Cisco was probably originally entitled The Maid of Mount Kisco and probably written or adapted by Sligo fiddler Paddy Killoran in the 1930s when in the USA. More background on the tune background at The Fiddler’s Companion (scroll down the page) and on recordings of it over at Irishtune.info. You can hear a recording of Leo Rowsome playing it on the uilleann pipes in 1948 here. The tune provides plenty of opportunities for rolls on A and G. After that workout though, a punchy, riffy reel in D will be in order. All resources can be found at The Flow, as per usual. 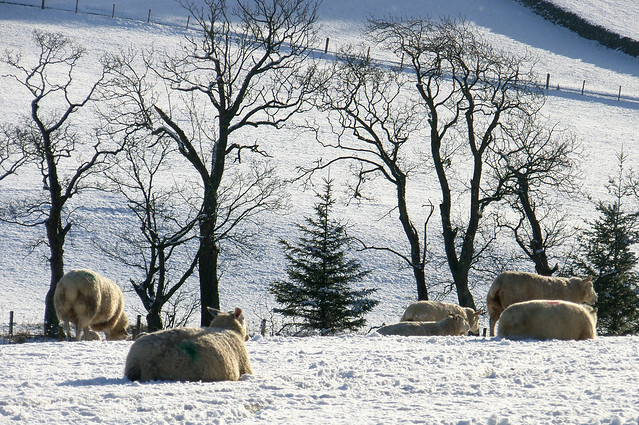 Photo of Peebles sheep in snow by Gavin Proc, some rights reserved. This entry was posted in classes, Community, FluteFling, Resources, Scots Music Group, The Flow and tagged community, flute, improver, Irish, reel, Scots, Scots Music Group, Scottish Borders, Shetland, Sligo, song air, traditional music. Bookmark the permalink.